Add artful design to your entryway, office, or studio. 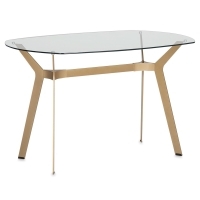 The Studio Designs Archtech Modern Writing Table combines modern design with a touch of luxury, so you can display photos, practice calligraphy, and journal in style. 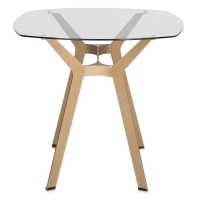 The table has gold-tone, powder-coated legs for durability, plus plastic feet to prevent floor scratches. It also has an 8 mm thick tempered safety glass top. 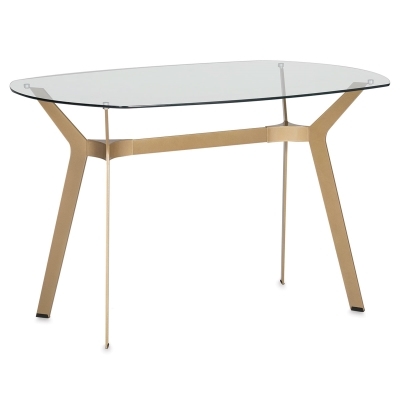 Made from 50% metal and 50% glass, the table measures 30"H × 48"W × 34"D. Pair it with the Studio Designs Archtech Modern End Table and Coffee Table for a cohesive look.